Remember this clock that my dad gave me after much begging on my part? I finally got it up on my entertainment center. Whatcha think? I totally reset the entire top of the entertainment center. Before, everything was dark, wood and such. Today, I used a little bit of everything from wicker to enamel to chippy metal. 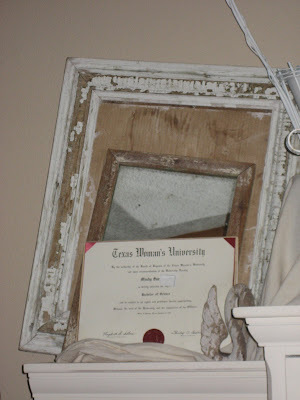 My sister, Lucy Jane came over, took a look at this frame/mirror/diploma and said "straighten it out". So, the lean is gone. I think she was right. No time to retake the pic though! Maybe later. 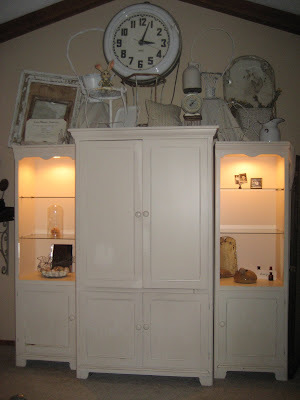 I'm still working on the entertainment center, but I wanted to give you a little peek at what is going on. Looks great! How do you have so much energy to do so much? You work, you have an antique shop, you host the road kill chili cookoff, you host family parties and you remodel and redecorate! You are the energizer bunny! It all looks really good! Love all the cream and white going on. I really like the white change. I say lean 'em just in different directions. But what do I know...I ain't the M&M's! Looks great! Love that clock! Malisa, how I do it, is I put everything off til the last minute. And then, I am non-stop. I work best under pressure. Not sane, I know. But, how I function. Additionally, I absolutely love to entertain. The year I turned 40, I had a party every single month. I had a ball organizing theme parties. It was a heck of a year! And, by the way, my house managed to stay pretty clean that year. Maybe I should start doing that again! Debbie, I might climb back up and try askewing them. See what I think. Mindy, I love what you've done - it looks just fab! 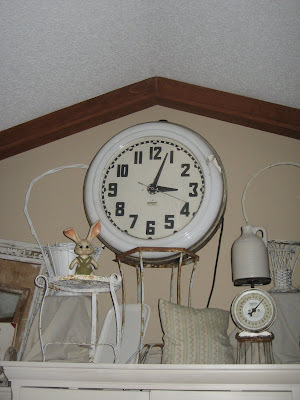 I so love that clock! Love all the whites and neutral tones with touches of rust. I have in my hands a decorating book titled "White on White" and your display looks like it's a page right out of the book! Great work junk friend! uuoooohhh! I love the new vingette! Off course you know I would love anything that is white! It was great to meet you, I wish we had more time to hang out, maybe in the fall you can plan to stay longer! 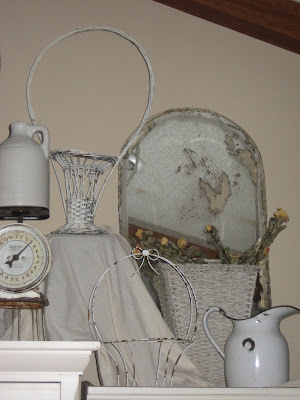 It looks good--I love the old mirror. I kind of went away from the chippy white for a bit, but now i am getting back into it. The display makes me want to even more. Off to some thrift stores now! Mindy, great change for summer...light and airy! Good Job! LOOKS AMAZING! and i like the lean. i love the whole look. i am a huge fan of white on white on white and you've done it! love it. I love all the textures you used in the display.